Do I File My Case in Federal or State Court? 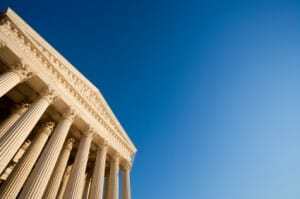 Home » Blog » Do I File My Case in Federal or State Court? When you are going to file your lawsuit, you may be wondering which court to file in. The answer depends on the subject matter jurisdiction. Jurisdiction is the court’s power to hear a case. Depending on the subject matter, a state or federal court may have the power to be able to hear and decide your case. Dashner Law Firm wants every client to be informed about his or her case each step of the way. Be aware that this is a brief summary of subject matter jurisdiction, and any specific questions regarding your case should be directed to your attorney. Federal question– When your case has a “federal question”, it means your case arises under federal law. This includes federal civil rights, patent law, antitrust laws, etc. Diversity of citizenship– Federal courts also hears cases when you are suing a citizen of a different state or country and asking for a minimum $75,000 in damages. If a federal court has jurisdiction based on the diversity of citizenship between the two parties and it meets the dollar amount, the subject matter of the case does not matter. If your personal injury case doesn’t fall under either of the federal requirements stated above, your case would be heard in state court. The most common issue parties face is which state court to file in. That is an issue of “venue” and is worked out through a complex set of balancing tests along with proper service. If you are unsure which state your lawsuit should be filed in, speak with an experienced attorney. For more information regarding federal or state jurisdiction, contact the experienced attorneys at Dashner Law. Call 972-793-8989 or 817-864-9980 today to schedule your initial consultation.